If it is about the health and comfort, be sure to get best solution. 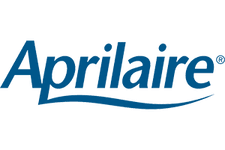 Aprilair is the division of Research Products Corporation that have long history to provide solutions for improvement in health and comfort through controlling air quality inside your homes. Research Products Corporation was incepted in 1938 and since then it is designing, manufacturing and distributing quality solutions and products across North America with a reputation of being innovator in the industry and was solidified in year 1953 when they introduced First Really Effective Whole-House Humidifier. The main product line or the total solution provided by the Aprilaire are Air purity solution, Humidity equipment, Fresh Air solutions, temperature control. 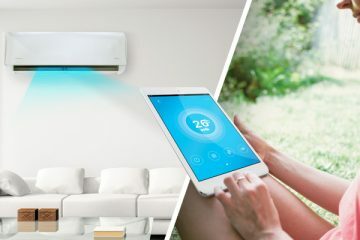 However if it is about the whole house solutions, it includes a big range of humidifiers, air purifiers, dehumidifiers, thermostats and ventilation. Aprilaire’s Whole house humidifier series is an excellent host to maintain healthier humidity across all rooms in colder seasons and even for whole year in drier climate. 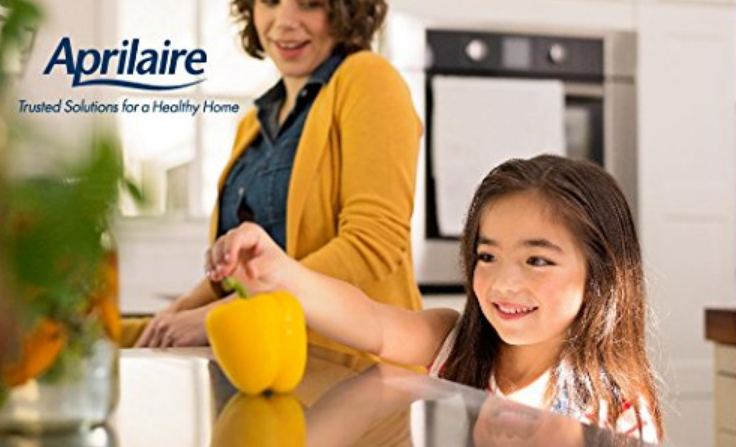 Every single model of whole house humidifier by Aprilaire delivers efficient humidification to entire home in connection to the existing ductwork and HVAC at your home. You can choose from flow-through, bypass or steam humidifiers right according to your needs and wants. Every singly system is featured with a manual or digital humidity controller to give you an easy and quiet operation. You will also be amazed when you see the Aprilaire’s library that include guides for cleaning and for maintenance, guides for installation as well as owner’s manuals that are all available at finger tips. All these will help you get most out of these whole house humidifiers. 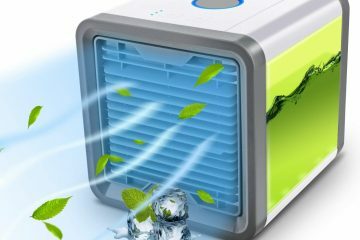 Following are the top recommended Aprilaire humidifiers for your home. 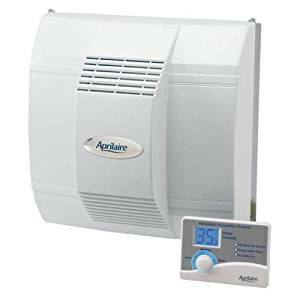 Get protection form dry air effects with Aprilaire 700 powered flow through humidifier that works with existing cooling and heating system to release appropriate humidity in all rooms. It is evaporative humidifier that dispense up to around 18 gallons moisture every day. It’s best to humidify the tightly sealed houses up to 4200 sq. ft. loosely sealed houses up to 1050 sq. ft. and average sealed houses up to 2,100 sq. ft. Connected to HVAC system, it humidifies your house with natural process of evaporation. When needed, water automatically start to flow from connected line in its distribution tray. Water is thoroughly distributed across width of the tray and then directed to flow on Aprilaire’s patented Water Panel System of Evaporator in center of humidifier. This moisture is then vaporized in the dry air, making a cozy humidified air which is in the end distributed through HVAC system. Home Size – Aprilaire 700 is meant to humidify loosely sealed house up to 1050 sq. ft., average sealed 2,100 sq. ft. and tightly sealed house up to 4,200 sq. ft.
Professional Contractor Needed For Installation – Aprilaire whole house humidifiers must be installed by a licensed, certified and experienced HVAC expert. 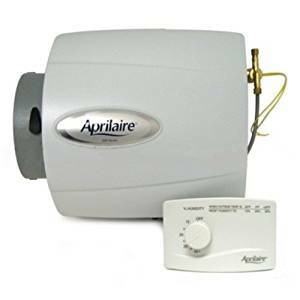 Maintain appropriate humidify level with Aprilaire 600 in-duct bypass humidifier which works on existing cooling and heating system at your home. Works as an evaporative humidifier and distribute up to 17 gallons of moisture every day. It’s best to humidify tightly sealed houses up to 4000 sq. ft. loosely sealed houses up to 1500 sq. ft. and average sealed houses up to 2,000 sq. ft. Connected to HVAC system, it stat humidifying the whole house with organic evaporation process. When water is needed, it automatically flows from attached line in a distribution tray. Water is evenly distributed across depth of tray and directed to flow on a patented Water Panel Evaporator by Aprilaire right in the middle of humidifier. This moisture is then distributed in the dry atmosphere of your home, creating a natural, cozy and humidified air through HVAC system. 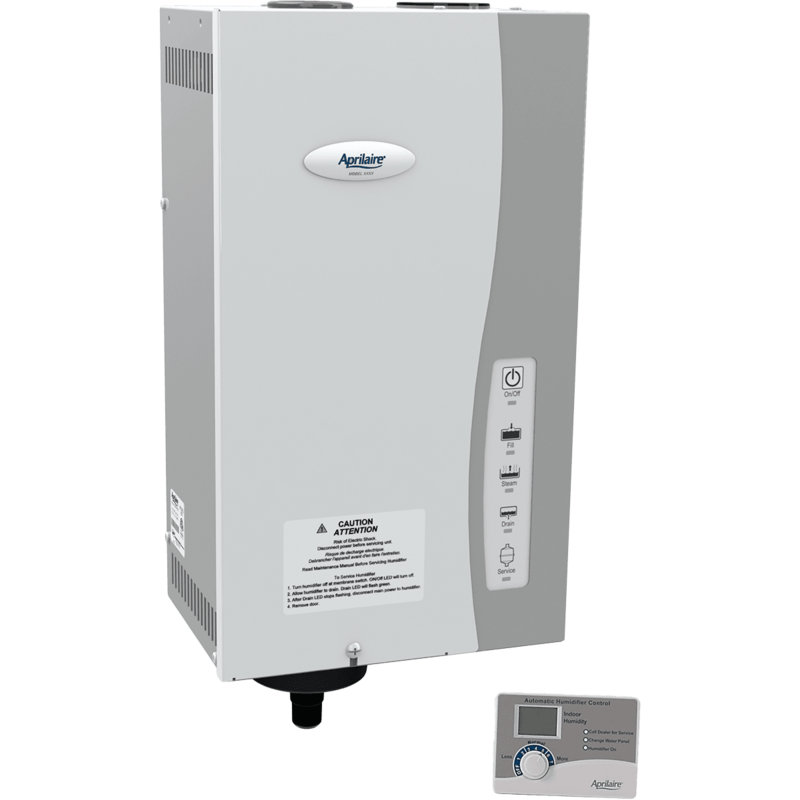 Home Size – Aprilaire 600 is designed to provide humidification to loosely sealed house up to 1500 sq. ft., average sealed 2,000 sq. ft. and tightly sealed up to 4,000 sq. ft.
Professional Assistance is needed to Install – Must be installed by a licensed, certified and experienced HVAC expert to ensure appropriate operation, as well as regular maintenance. Increase your comfort level and save your home in dry winter season or even year around year with Aprilaire 500 Small Bypass whole house humidifier. It works with HVAC and deliver humidification of around 12 gallons moisture to keep every room moisture every day. It is fine to humidify 3,000 sq. ft. of tightly sealed home, 750 sq. ft. of loosely sealed home and 1,500 sq. ft. of average sealed home. 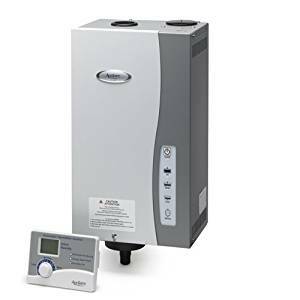 In connection to HVAC system, this bypass humidifier humidify your space with natural evaporation process. When more humidity is needed, water automatically flows through connected line in distribution tray present at the top of unit and then evenly distributed across width of the tray and directed towards a Water Evaporator Panel patented by Aprilair right to middle of humidifier unit. This distributed moisture is then evaporated in incoming dry air and make air humidified. This humidified air is disbursed across the area by HVAC system returning duct through blower. 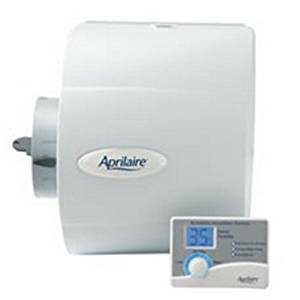 Ideal for for Small homes – Aprilaire 500 is small bypass whole house humidifier so expect it to work for 3,000 sq. ft homes that are tightly sealed, 1,500 sq. ft. homes that are average sealed and 750 sq. ft. homes that are loosely sealed. Take Professional Assistance for Installation – To ensure best operation and maintenance and proper installation it is good if you hire some licensed and certified professional for its installation. It works independent of your HVAC system to deliver steam humidification using existing ductwork. 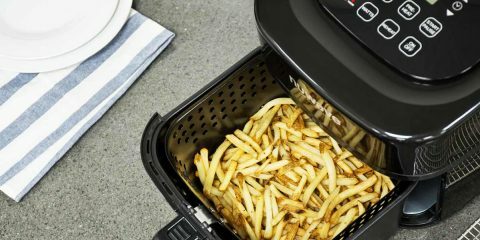 It produces steam by energizing two electrodes which extend in canister water reservoir. Current flow between electrodes, boils the water and create steam which then flows by steam hose and injected into moving air by distribution tube. 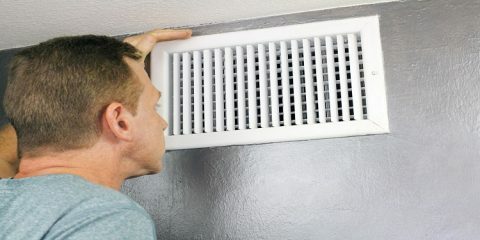 This humidity then flow evenly through air ducts and then in rooms. Aprilaire 800’s complete capacity depend electrical voltage you have chosen. At 240 V, system it gives 23.3 gallons of moisture, at 208 V. it delivers 20.5 gallons and at 110 V. it releases around 11.5 gallons of moisture each day. House Size – Ideal for tightly sealed homes up to 6,200 sq. ft. When you are in need to humidify your whole house, but do not want more robust system like traditional in-duct whole house humidifier, go with Aprilair Modulating Steam 810 model. It also operate independent to HVAC system and distribute around 34.6 gallons moisture to space as large as 6,200 sq. ft. The modulating output in this unit allows to reach a tighter humidity control as compared to other steam based humidifiers, with 3 percent of desired set point and because of this unique modulation it becomes best choice for buildings and homes with furniture, musical instruments, wall paintings and other wooden interiors that are sensitive to dry air. This unit energizes two electrodes which extend in a canister full of water. When current flows between 2 electrodes it boils the water and create steam which then flows through distribution tube and humidify air which is then released by ductwork. Its output of humidity depends on electrical potential used, for e.g. at 120 volts expect 15 gallons, at 208 Volts expect 30 gallons and at 240 Volts expect around 34 gallons of moisture each day. Disposable canister that normally needs to be changed once annually. Control board which manages functionslike draining and filling, maintain voltage, water level and indicate need for service. Modulating output that maintain desired level of humidity within 3 percent.